Agraria Lime & Orange Blossoms Woven Crystal Perfume Candle, 7 oz. AgrariaLime & Orange Blossoms Woven Crystal Perfume Candle, 7 oz. 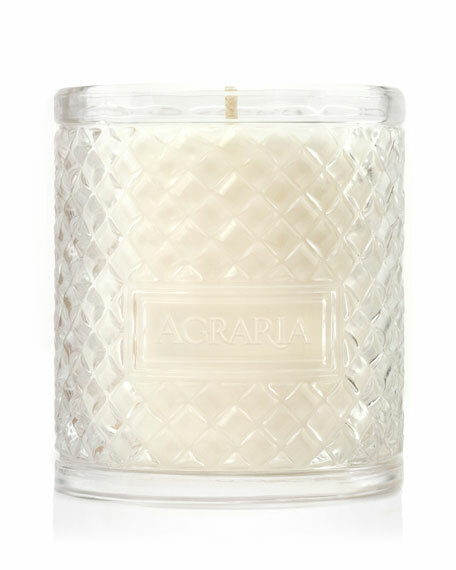 Agraria's Perfume Candles are presented in a woven crystal glass and silver-plated lid with the Agraria crest. The design is a modern interpretation of the woven palm leaf cases used for 20 years beginning in the early 1980s. These beautifully luminous, fragrant, and clean burning candles are a special blend of vegetable-based premium soft waxes. The Fragrance: Welcome to an exhilarating fragrance filled with Lime & Orange Blossoms, and surrounded by the beauty of Night-Blooming Sampaguita, Honeysuckle, and Jasmine. Amber Woods, Smoky Patchouli and Oak Moss add depth to a velvety smooth background. Features a lead-free wick and includes silver-plated lid stamped with the Agraria crest. Approximate burning time: 30-40 hours; 7 oz. (198g).